Published in 1998, Limited edition print sold out. Collectors Series prints available. After the tremendous public response to the first of my London prints, 'Memories of London', I found myself back in the capital to get fresh ideas for a new London painting much earlier than I had expected. This time I decided on an imaginary viewpoint to the north side of the city looking southwards, to contrast with the first image where I was looking across the Thames from the south west. 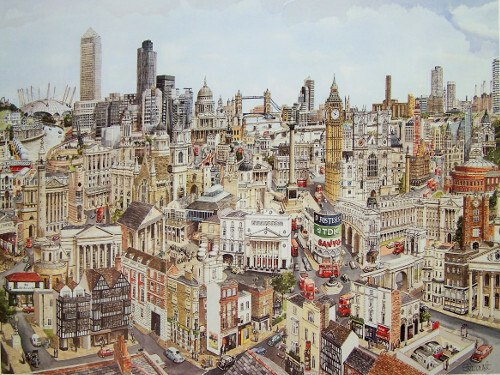 Many of the famous landmarks reappear in this London cityscape, in different aspect and scale, while others emerge for the first time. For instance The Dome (which was under construction), New Scotland Yard, Arsenal's efforts brought Highbury into the scene, and the underground world of London Transport appears in the form of a Tube station. This second of my London paintings sold through the galleries even quicker than the first, and I started to realise that I could well be coming back to the city again and again. The original watercolour was a corporate purchase and was hung in the boardroom on the top floor of one of the City's skyscrapers.